Damage control is a fundamental shift from the traditional surgical focus of anatomical restoration to that of physiological restoration. Pringle perhaps ushered the damage control concept by advocating temporary inflow occlusion and perihepatic packing for liver hemorrhage in 1908. In 1982, Kashuk et al. 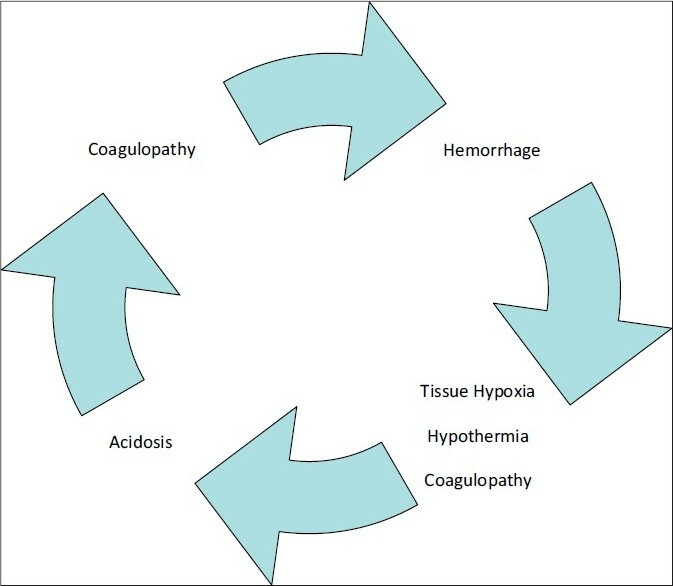 described the development of the "vicious cycle" of hypothermia, coagulopathy, and acidosis in major abdominal vascular injuries [Figure 1]. Stone et al. described truncating the operative procedure at the first indication of major coagulopathy in the following year. As originally described, the damage control concept consists of 3 separate components. Initially, the patient undergoes resuscitative, abbreviated surgery, where control of hemorrhage and contamination is rapidly obtained and definitive repairs deferred. The patient is then transported to the Intensive Care Unit (ICU) where active rewarming, correction of coagulopathy and acidosis occurs. Once normal physiology is restored, definitive surgical management is completed. Figure 1: The "Vicious Cycle" from Kashuk et al. Independently, hypothermia, coagulopathy, and acidosis have been demonstrated to worsen the outcome of severely injured patients. If not corrected, each component can further perpetuate the vicious cycle, resulting in certain death. The damage control approach is only suitable for select group of patients. In Rotondo et al's original series, only patients with major vascular injury and 2 or more visceral injuries showed a survival benefit with a damage control approach. Thus, only those with a severe injury pattern, whose physiologic reserve is insufficient to tolerate a prolonged, definitive operative procedure, should be subjected to a damage control approach. Asensio et al. 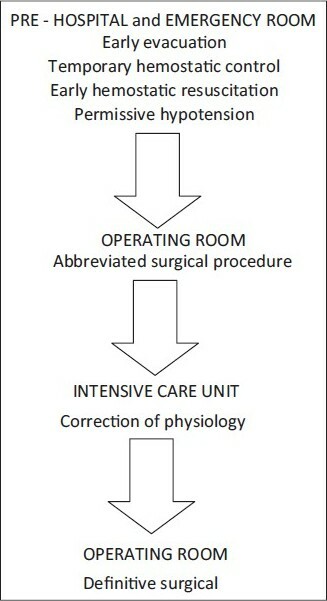 identified pre-operating room characteristics predictive of "exsanguinating syndrome," in which a damage control approach would be appropriate [Box 1]. [Additional file 1] There is a 98% probability of developing life-threatening coagulopathy if the Injury Severity Score is >25, systolic blood pressure < 70 mmHg, pH < 7.1, and temperature < 34ºC. Moore et al. 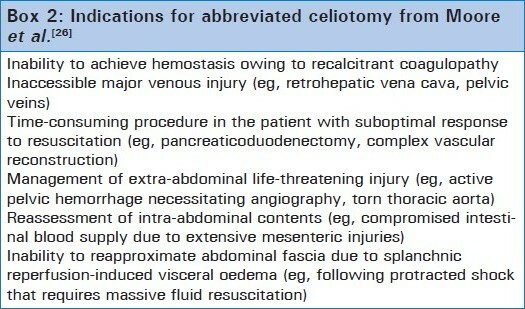 outlined indications for abbreviating the laparotomy [Box 2]. [Additional file 2] If the physiological boundaries have been breached, operative interventions must be abbreviated. Hirshberg and Mattox  furthermore recommend that "injury pattern recognition" guide the experienced surgeon toward an abbreviated operation. Damage control principles are applicable in all initial phases of care of the severely injured patient [Figure 2]. Temporary and definitive interventions at each phase are summarized in [Table 1]. The concept of "permissive hypotension" was originally noted by Cannon et al. and subsequently shown by Bickell et al. to be beneficial in patients with penetrating injuries to the torso. Early hemostatic resuscitation has also been described as "damage control resuscitation." The concept behind this strategy is that early replacement of blood, plasma, and platelets will prevent spiralling into the vicious cycle due to excessive infusion of crystalloid solution. The military experience in Iraq indicated a physiological improvement in those injured soldiers resuscitated with a 1:1:1 ratio of Packed Red Blood Cells toFresh Frozen Plasma and Platelets, respectively. ,,,, Emerging data suggest that this strategy may likewise improve survival in severely injured civilian trauma patients, ,, but awaits confirmation in prospective trials. Within the operating room, damage control concepts apply to both anesthesia and surgery. Damage control anesthesia aims to rapidly establish a definitive airway, maintain oxygenation, prevent hypothermia, initiate correction of coagulopathy, and maintain permissive hypotension until definitive hemorrhage control has been obtained , [Table 2]. Thoracic injuries present a unique challenge, as structures within the chest are not easily controlled with temporary maneuvers. Rapid and definitive control of hemorrhage and air leaks is required. Packing is limited to the apices and cardiophrenic angles, but lung injuries can be rapidly controlled with nonanatomic, stapled wedge resections. Pulmonary tractotomy can achieve rapid hemorrhage control in penetrating lung injury. , Esophageal injuries are best treated by diversion and wide drainage. Temporary closure can be achieved by simple mass closure or vacuum-assisted dressings. , Definitive procedures at re-operation include removal of packs, thorough exploration for air leaks, and chest wall closure. The critical component of head injury management is prevention of secondary brain injury. , Optimizing the general condition of the patient is essential in optimizing outcomes from head injury. Damage control neurosurgery involves rapid arrest of intracranial bleeding, the evacuation of intracranial hematomas and the early debridement of compound wounds to the skull. Craniectomy may be beneficial for cerebral edema, however, dural closure should be attempted to prevent intracranial infection. The extent of debridement, however, remains a controversial issue, as aggressive debridement of brain tissue, bone and missile fragments, may at times worsen neurologic deficits. , Bone defects are repaired once the brain swelling subsides. A review by Rotondo et al. identified an overall 50% mortality and 40% morbidity in 961 damage control patients. The early reports of damage control surgery demonstrated a significant improvement in mortality when comparing patients undergoing abbreviated procedures to those patients undergoing conventional surgery. , More recent series have confirmed a survival benefit with the damage control approach. , It is important to note that these comparisons apply to damage control laparotomy; mortality outcomes have not yet been demonstrated in other damage control procedures. It is essential that trauma providers be au-fait with the principles of damage control for they are clearly life-saving in many patients with multisystem trauma. The damage control concept originated over 100 years ago, and has since grown to encompass all phases of the initial care of the severely injured patient. By learning from the accumulated experience, outcomes and complications of damage control, modern surgeons can apply this strategy following a rationalized approach. Nowadays, damage control principles are also applied for non-trauma care, including the treatment of abdominal compartment syndrome and intra-abdominal sepsis. , Ongoing and future developments will continue to define the most appropriate patients that may benefit from damage control. 1. Navy US. Surface Ship Survivability. United States: Naval War Publications; 1996. p. 3-20.31. 2. Rotondo MF, Schwab CW, McGonigal MD, Phillips GR 3 rd , Fruchterman TM, Kauder DR, et al. 'Damage control': An approach for improved survival in exsanguinating penetrating abdominal injury. J Trauma 1993;35:375-82. 3. Pringle JH. Notes on the arrest of hepatic hemorrhage due to trauma. Ann Surg 1908;48:541-9. 4. Kashuk JL, Moore EE, Millikan JS, Moore JB. Major abdominal vascular trauma--a unified approach. J Trauma 1982;22:672-9. 5. Stone HH, Strom PR, Mullins RJ. Management of the major coagulopathy with onset during laparotomy. Ann Surg 1983;197:532-5. 6. Shapiro MB, Jenkins DH, Schwab CW, Rotondo MF. Damage control: Collective review. J Trauma 2000;49:969-78. 7. Luna GK, Maier RV, Pavlin EG, Anardi D, Copass MK, Oreskovich MR. Incidence and effect of hypothermia in seriously injured patients. J Trauma 1987;27:1014-8. 8. Gregory JS, Flancbaum L, Townsend MC, Cloutier CT, Jonasson O. Incidence and timing of hypothermia in trauma patients undergoing operations. J Trauma 1991;31:795-8. 9. Steinemann S, Shackford SR, Davis JW. 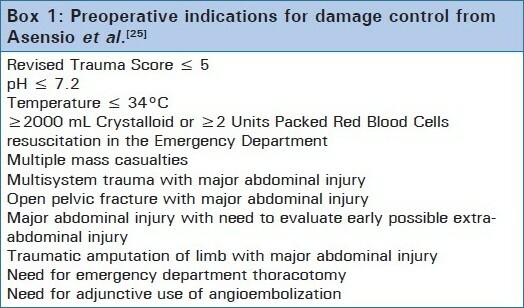 Implications of admission hypothermia in trauma patients. J Trauma 1990;30:200-2. 10. Jurkovich GJ, Greiser WB, Luterman A, Curreri PW. Hypothermia in trauma victims: An ominous predictor of survival. J Trauma 1987;27:1019-24. 11. Loveland JA, Boffard KD. Damage control in the abdomen and beyond. Br J Surg 2004;91:1095-101. 12. Gubler KD, Gentilello LM, Hassantash SA, Maier RV. The impact of hypothermia on dilutional coagulopathy. J Trauma 1994;36:847-51. 13. Ferrara A, MacArthur JD, Wright HK, Modlin IM, McMillen MA. Hypothermia and acidosis worsen coagulopathy in the patient requiring massive transfusion. Am J Surg 1990;160:515-8. 14. Valeri CR, Feingold H, Cassidy G, Ragno G, Khuri S, Altschule MD. Hypothermia-induced reversible platelet dysfunction. Ann Surg 1987;205:175-81. 15. Brohi K, Cohen MJ, Davenport RA. Acute coagulopathy of trauma: Mechanism, identification and effect. Curr Opin Crit Care 2007;13:680-5. 16. MacLeod JB, Lynn M, McKenney MG, Cohn SM, Murtha M. Early coagulopathy predicts mortality in trauma. J Trauma 2003;55:39-44. 17. Maegele M, Lefering R, Yucel N, Tjardes T, Rixen D, Paffrath T, et al., Early coagulopathy in multiple injury: An analysis from the German Trauma Registry on 8724 patients. Injury 2007;38:298-304. 19. Brohi K, Cohen MJ, Ganter MT, Schultz MJ, Levi M, Mackersie RC, et al. Acute coagulopathy of trauma: Hypoperfusion induces systemic anticoagulation and hyperfibrinolysis. J Trauma 2008;64:1211-7. 20. Downing SE, Talner NS, Gardner TH. Influences of hypoxemia and acidemia on left ventricular function. Am J Physiol 1966;210:1327-34. 21. Wildenthal K, Mierzwiak DS, Myers RW, Mitchell JH. Effects of acute lactic acidosis on left ventricular performance. Am J Physiol 1968;214:1352-9. 22. Dunn EL, Moore EE, Breslich DJ, Galloway WB. Acidosis-induced coagulopathy. Surg Forum 1979;30:471-3. 23. Manger WM, Nahas GG, Hassam D, Habif DV, Papper EM. Effect of pH control and increased O2 delivery on the course of hemorrhagic shock. Ann Surg 1962;156:503-10. 24. Moore EE, Dunn EL, Breslich DJ, Galloway WB. Platelet abnormalities associated with massive autotransfusion. J Trauma 1980;20:1052-6. 25. Asensio JA, McDuffie L, Petrone P, Roldañ G, Forno W, Gambaro E, et al . Reliable variables in the exsanguinated patient which indicate damage control and predict outcome. Am J Surg 2001;182:743-51. 26. Moore EE, Burch JM, Franciose RJ, Offner PJ, Biffl WL. Staged physiologic restoration and damage control surgery. World J Surg 1998;22:1184-90. 27. Hirshberg A, Wall MJ Jr, Mattox KL. Planned reoperation for trauma: A two year experience with 124 consecutive patients. J Trauma 1994;37:365-9. 28. Ham AA, Coveler LA. Anesthetic considerations in damage control surgery. Surg Clin North Am 1997;77:909-20. 29. 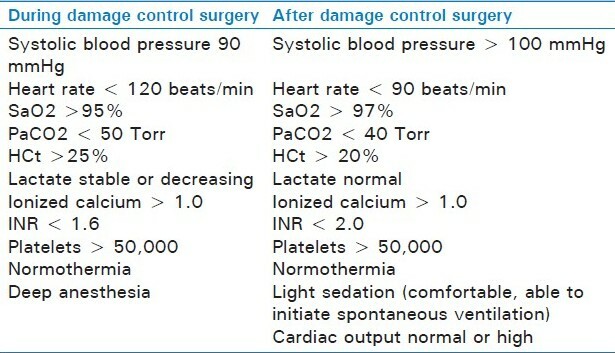 Dutton R. Damage control anesthesia. TraumaCare 2005;15:197-201. 30. Wall MJ Jr, Soltero E. Damage control for thoracic injuries. Surg Clin North Am 1997;77:863-78. 31. Aucar JA, Hirshberg A. Damage control for vascular injuries. Surg Clin North Am 1997;77:853-62. 32. Rosenfeld JV. Damage control neurosurgery. Injury 2004;35:655-60. 33. Giannoudis PV, Pape HC. Damage control orthopaedics in unstable pelvic ring injuries. Injury 2004;35:671-7. 34. Roberts CS, Pape HC, Jones AL, Malkani AL, Rodriguez JL, Giannoudis PV. Damage control orthopaedics: Evolving concepts in the treatment of patients who have sustained orthopaedic trauma. Instr Course Lect 2005;54:447-62. 35. Rotondo MF, Bard MR. Damage control surgery for thoracic injuries. Injury 2004;35:649-54. 36. Hildebrand F, Giannoudis P, Kretteck C, Pape HC. Damage control: Extremities. Injury 2004;35:678-89. 37. Wall MJ Jr, Villavicencio RT, Miller CC 3 rd , Aucar JA, Granchi TA, Liscum KR, et al. Pulmonary tractotomy as an abbreviated thoracotomy technique. J Trauma 1998;45:1015-23. 38. Grotz MR, Gummerson NW, Gänsslen A, Petrowsky H, Keel M, Allami MK, et al. Staged management and outcome of combined pelvic and liver trauma. An international experience of the deadly duo. Injury 2006;37:642-51. 39. Scalea TM, Mann R, Austin R, Hirschowitz M. Staged procedures for exsanguinating lower extremity trauma: An extension of a technique--case report. J Trauma 1994;36:291-3. 40. Pape HC, Tornetta P 3 rd , Tarkin I, Tzioupis C, Sabeson V, Olson SA. Timing of fracture fixation in multitrauma patients: The role of early total care and damage control surgery. J Am Acad Orthop Surg 2009;17:541-9. 41. Ball CG, Feliciano DV. Damage control techniques for common and external iliac artery injuries: Have temporary intravascular shunts replaced the need for ligation? J Trauma 2010;68:1117-20. 42. Jaicks RR, Cohn SM, Moller BA. Early fracture fixation may be deleterious after head injury. J Trauma 1997;42:1-5. 43. Pape HC, Auf'm'Kolk M, Paffrath T, Regel G, Sturm JA, Tscherne H. Primary intramedullary femur fixation in multiple trauma patients with associated lung contusion--a cause of posttraumatic ARDS? J Trauma 1993;34:540-7. 44. Pape HC, Hildebrand F, Pertschy S, Zelle B, Garapati R, Grimme K, et al. Changes in the management of femoral shaft fractures in polytrauma patients: From early total care to damage control orthopedic surgery. J Trauma 2002;53:452-61. 45. McCaughey BG, Garrick J, Carey LC, Kelley JB. Naval Support Activity Hospital, Danang, Combat casualty study. Mil Med 1988;153:109-14. 46. McNamara JJ, Stremple JF. Causes of death following combat injury in an evacuation hospital in Vietnam. J Trauma 1972;12:1010-2. 47. Blackbourne LH. Combat damage control surgery. Crit Care Med 2008;36:S304-10. 48. Kragh JF Jr, Littrel ML, Jones JA, Walters TJ, Baer DG, Wade CE, et al. Battle Casualty Survival with Emergency Tourniquet Use to Stop Limb Bleeding. J Emerg Med 2009. [In press]. 49. Kragh JF Jr, Walters TJ, Baer DG, Fox CJ, Wade CE, Salinas J, et al. Practical use of emergency tourniquets to stop bleeding in major limb trauma. J Trauma 2008;64:S38-49. 50. Kragh JF Jr, Walters TJ, Baer DG, Fox CJ, Wade CE, Salinas J, et al. Survival with emergency tourniquet use to stop bleeding in major limb trauma. Ann Surg 2009;249:1-7. 51. Lakstein D, Blumenfeld A, Sokolov T, Lin G, Bssorai R, Lynn M, et al. Tourniquets for hemorrhage control on the battlefield: A 4-year accumulated experience. J Trauma 2003;54:S221-5. 52. Starnes BW, Beekley AC, Sebesta JA, Andersen CA, Rush RM Jr. Extremity vascular injuries on the battlefield: Tips for surgeons deploying to war. J Trauma 2006;60:432-42. 53. Achneck HE, Sileshi B, Jamiolkowski RM, Albala DM, Shapiro ML, Lawson JH. A comprehensive review of topical hemostatic agents: Efficacy and recommendations for use. Ann Surg 2010;251:217-28. 54. Cox ED, Schreiber MA, McManus J, Wade CE, Holcomb JB. New hemostatic agents in the combat setting. Transfusion 2009;49:248S-55S. 55. Cannon W, Fraser J, Cowell E. The preventative treatment of wound shock. JAMA 1918;70:618. 56. Bickell WH, Wall MJ Jr, Pepe PE, Martin RR, Ginger VF, Allen MK, et al. Immediate versus delayed fluid resuscitation for hypotensive patients with penetrating torso injuries. N Engl J Med 1994;331:1105-9. 57. Fox CJ, Gillespie DL, Cox ED, Kragh JF Jr, Mehta SG, Salinas J, et al. Damage control resuscitation for vascular surgery in a combat support hospital. J Trauma 2008;65:1-9. 58. Fox CJ, Gillespie DL, Cox ED, Mehta SG, Kragh JF Jr, Salinas J, et al. The effectiveness of a damage control resuscitation strategy for vascular injury in a combat support hospital: Results of a case control study. J Trauma 2008;64:S99-106. 59. Holcomb JB. Damage control resuscitation. J Trauma 2007;62:S36-7. 60. Holcomb JB, Jenkins D, Rhee P, Johannigman J, Mahoney P, Mehta S, et al. Damage control resuscitation: Directly addressing the early coagulopathy of trauma. J Trauma 2007;62:307-10. 61. Duchesne JC, Islam TM, Stuke L, Timmer JR, Barbeau JM, Marr AB, et al. Hemostatic resuscitation during surgery improves survival in patients with traumatic-induced coagulopathy. J Trauma 2009;67:33-7. 62. Duchesne JC, Kimonis K, Marr AB, Rennie KV, Wahl G, Wells JE, et al. Damage control resuscitation in combination with damage control laparotomy: A survival advantage. J Trauma 2010;69:46-52. 63. Holcomb JB, Wade CE, Michalek JE, Chisholm GB, Zarzabal LA, Schreiber MA, et al. Increased plasma and platelet to red blood cell ratios improves outcome in 466 massively transfused civilian trauma patients. Ann Surg 2008;248:447-58. 64. Burch JM, Ortiz VB, Richardson RJ, Martin RR, Mattox KL, Jordan GL Jr. Abbreviated laparotomy and planned reoperation for critically injured patients. Ann Surg 1992;215:476-83. 65. Carrillo EH, Bergamini TM, Miller FB, Richardson JD. Abdominal vascular injuries. J Trauma 1997;43:164-71. 66. Feliciano DV, Mattox KL, Burch JM, Bitondo CG, Jordan GL Jr. Packing for control of hepatic hemorrhage. J Trauma 1986;26:738-43. 67. Reilly PM, Rotondo MF, Carpenter JP, Sherr SA, Schwab CW. Temporary vascular continuity during damage control: Intraluminal shunting for proximal superior mesenteric artery injury. J Trauma 1995;39:757-60. 68. Barker DE, Green JM, Maxwell RA, Smith PW, Mejia VA, Dart BW, et al. Experience with vacuum-pack temporary abdominal wound closure in 258 trauma and general and vascular surgical patients. J Am Coll Surg 2007;204:784-92. 69. Garner GB, Ware DN, Cocanour CS, Duke JH, McKinley BA, Kozar RA, et al. Vacuum-assisted wound closure provides early fascial reapproximation in trauma patients with open abdomens. Am J Surg 2001;182:630-8. 70. Asensio JA, Demetriades D, Berne JD, Velmahos G, Cornwell EE 3 rd , Murray J, et al. Stapled pulmonary tractotomy: A rapid way to control hemorrhage in penetrating pulmonary injuries. J Am Coll Surg 1997;185:486-7. 71. Pourmoghadam KK, Fogler RJ, Shaftan GW. Ligation: An alternative for control of exsanguination in major vascular injuries. J Trauma 1997;43:126-30. 72. Eger M, Golcman L, Goldstein A, Hirsch M. The use of a temporary shunt in the management of arterial vascular injuries. Surg Gynecol Obstet 1971;132:67-70. 73. Sriussadaporn S, Pak-art R. Temporary intravascular shunt in complex extremity vascular injuries. J Trauma 2002;52:1129-33. 74. Jacob JE. Compartment syndrome. A potential cause of amputation in battlefield vascular injuries. Int Surg 1974;59:542-8. 75. Bone LB, Johnson KD, Weigelt J, Scheinberg R. Early versus delayed stabilization of femoral fractures. A prospective randomized study. J Bone Joint Surg Am 1989;71:336-40. 76. Brundage SI, McGhan R, Jurkovich GJ, Mack CD, Maier RV. Timing of femur fracture fixation: Effect on outcome in patients with thoracic and head injuries. J Trauma 2002;52:299-307. 77. Dan NG, Berry G, Kwok B, Mandryk JA, Ring IT, Sewell MF, et al. Experience with extradural haematomas in New South Wales. Aust N Z J Surg 1986;56:535-41. 78. Stening WA, Berry G, Dan NG, Kwok B, Mandryk JA, Ring I, et al. Experience with acute subdural haematomas in New South Wales. Aust N Z J Surg 1986;56:549-56. 79. Brandvold B, Levi L, Feinsod M, George ED. Penetrating craniocerebral injuries in the Israeli involvement in the Lebanese conflict, 1982-1985. Analysis of a less aggressive surgical approach. J Neurosurg 1990;72:15-21. 80. Taha JM, Saba MI, Brown JA. Missile injuries to the brain treated by simple wound closure: Results of a protocol during the Lebanese conflict. Neurosurgery 1991;29:380-3. 81. Parr MJ, Alabdi T. Damage control surgery and intensive care. Injury 2004;35:713-22. 82. Sagraves SG, Toschlog EA, Rotondo MF. Damage control surgery--the intensivist's role. J Intensive Care Med 2006;21:5-16. 83. Booke M, Sielenkämper A. [Massive transfusion with the rapid infusion system. Its effect on core body temperature]. Anaesthesist 2001;50:926-9. 84. Dunham CM, Belzberg H, Lyles R, Weireter L, Skurdal D, Sullivan G, et al. The rapid infusion system: A superior method for the resuscitation of hypovolemic trauma patients. Resuscitation 1991;21:207-27. 85. Gentilello LM, Cobean RA, Offner PJ, Soderberg RW, Jurkovich GJ. Continuous arteriovenous rewarming: Rapid reversal of hypothermia in critically ill patients. J Trauma 1992;32:316-25. 86. Boffard KD, Riou B, Warren B, Choong PI, Rizoli S, Rossaint R, et al. Recombinant factor VIIa as adjunctive therapy for bleeding control in severely injured trauma patients: Two parallel randomized, placebo-controlled, double-blind clinical trials. J Trauma 2005;59:8-15. 87. Dutton RP, Hess JR, Scalea TM. Recombinant factor VIIa for control of hemorrhage: Early experience in critically ill trauma patients. J Clin Anesth 2003;15:184-8. 88. Rotondo MF, Zonies DH. The damage control sequence and underlying logic. Surg Clin North Am 1997;77:761-77. 89. Finlay IG, Edwards TJ, Lambert AW. Damage control laparotomy. Br J Surg 2004;91:83-5. 90. Nicholas JM, Rix EP, Easley KA, Feliciano DV, Cava RA, Ingram WL, et al. Changing patterns in the management of penetrating abdominal trauma: The more things change, the more they stay the same. J Trauma 2003;55:1095-108. 91. Abikhaled JA, Granchi TS, Wall MJ, Hirshberg A, Mattox KL. Prolonged abdominal packing for trauma is associated with increased morbidity and mortality. Am Surg 1997;63:1109-12. 92. Ekeh AP, McCarthy MC, Woods RJ, Walusimbi M, Saxe JM, Patterson LA. Delayed closure of ventral abdominal hernias after severe trauma. Am J Surg 2006;191:391-5. 93. Higa G, Friese R, O'Keeffe T, Wynne J, Bowlby P, Ziemba M, et al. Damage control laparotomy: A vital tool once overused. J Trauma 2010;69:53-9. 94. Stawicki SP, Brooks A, Bilski T, Scaff D, Gupta R, Schwab CW, et al. The concept of damage control: Extending the paradigm to emergency general surgery. Injury 2008;39:93-101. 95. Van Ruler O, Mahler CW, Boer KR, Reuland EA, Gooszen HG, Opmeer BC, et al. Comparison of on-demand vs planned relaparotomy strategy in patients with severe peritonitis: A randomized trial. JAMA 2007;298:865-72. 3 Initial management of complex hand injuries in military or austere environments: how to defer and prepare for definitive repair?